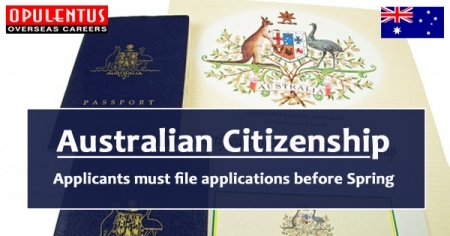 Permanent residents must file applications for Australian citizenship before spring. Presently, there are figures suggesting that the processing queue in the Department of Immigration has exceeded by more than 300 per cent. ? New data of the Department of Home Affairs demonstrates that the number of PRs who are waiting for the approval of citizenship applications has increased severely. Presently it is 189,000 under the Coalition leadership. Many of these applicants (140,000) were added after PM Turnbull, assumed office. In the past, the numbers of migrants who apply annually for becoming citizens were in the range of 190,000-200,000. The figure remained static in comparison to the 130,000 applications approved each year after 2013. The right to submit application for work in public sector needing security clearance. The processing delays were made worse by the failed attempt of the government in introducing hard restrictions on citizenship applications. Introducing failing feature for applicants who cheat in the Citizenship Test. These changes were defeated in the Senate in October 2017; but the government aims to reintroduce them in 2018. Moreover there are more attempts by the Coalition to get support for this legislation after a new set of changes. These include a trimmed conversational English test, to be used to streamline the processing stage. Data reveals that 75 percent of citizenship applicants have to wait for more than 13 months for a Department of Home Affairs decision. The Average processing time is more than three months below in comparison to October 2017. The Minister for Citizenship, Alan Tudge, defended the increase in processing times of the department, and said that many factors contributed to the application backlog. To get more details related to Australia fill out a Free Evaluation Form or contact us at [email protected] or call us 7207111222. One of our experts will meet your expectations and provide answers to queries.